Riverside Raceway (9/9/03) - Fritz took the lead early and went on to win the Street Stock heat race. Marlys finished 2nd in the Pure Stock heat. It looked like Fritz had a good chance of picking up his 5th feature win of the year, but it wasn't meant to be. Fritz pulled out early in the feature while leading after the car threw the belts yet again, despite having made several attempts to fix the problem during the past couple weeks of racing. Marlys had a rough feature as well. She was involved in a wreck as she was in 3rd and taking the white flag. She was put to the back along with two other drivers with two laps to go. TNT Speedway (9/6/03) - Mechanical problems were not an issue for Fritz this night. He finished 4th in his Street Stock heat race. Fritz had his best feature run in several nights with his 2nd place finish. TNT Speedway (9/5/03) - Fritz was ready to race but the car apparently wasn't. Fritz ran conservative in the heat race, trying to prevent the belts from flying off again. He finished 5th. Fritz was unable to complete the Street Stock feature due to the belts coming off. Riverside Raceway (8/31/03) - The regular season ended on a disappointing note at Riverside Raceway for Fritz and Marlys. Neither were able to make much progress in their heat races and both ended up with 4th place heat finishes. Fritz lost the belts in his heat. Marlys had a great draw for the feature, starting on the pole. Unfortunately her tire went flat with a few laps to go, ending any chance of her winning the Pure Stock championship. She ended the year 2nd in Pure Stock points. The Street Stock feature was even worse for Fritz. A car spun in front of Fritz leaving him nowhere to go. The rear end of the car was destroyed in the accident, putting Fritz out of the feature and dropping him to 3rd place in the final Street Stock point standings. Langlade County Raceway (8/30/03) - Fritz made his first trip to Antigo this year. Fritz finished 3rd in his Street Stock heat race. Unfortunately the car died while in line to start the feature and wouldn't restart. Riverside Raceway (8/26/03) - It was a rough night for Fritz and Marlys. Fritz wasn't able to make much headway in his Street Stock heat or in the feature. He finished 4th in the heat and 6th in the feature. He is remains 2nd in Street Stock points. Marlys finished 4th in her Pure Stock heat race. In the feature she managed to work her way up to 3rd place, but the motor eventually overheated due to a punctured radiator. As a result of the motor problems she spun and was unable to start her car. She finished 7th and fell to second place in the Pure Stock points. Riverside Raceway (8/19/03) - Fritz started off the night strong by winning his Street Stock heat race. Marlys finished 4th in her Pure Stock heat. It looked like Fritz would be able to extend his point lead in the feature. He started on the pole and grabbed the lead early. Unfortunately he spun on lap two, and was shuffled to the back of the pack as a result. He finished sixth and fell to second in the Street Stock point standings. Marlys was able to maintain her point lead by finishing 4th in the Pure Stock feature. TNT Speedway (8/16/03) - Fritz started the Street Stock heat race in the inside second row while Tate started outside of him. At the green flag the outside row quickly lost ground. Fritz grabbed the lead early and dominated the heat race. Tate finished 4th. Tate had his best feature draw of the year, starting on the pole. Tate held the lead early, lost it after an early restart, and quickly gained it back again. Unfortunately Tate's right rear tire went flat close to half way in the feature, putting him out for the night. Fritz finished 3rd. Riverside Raceway (8/12/03) - Fritz continues to battle for the Street Stock point lead. He finished 2nd in his heat and 3rd in the feature to move up to a tie for the lead in Street Stock points. Marlys crossed the finish line first in her heat race, but in a re-occurring theme for her this year, she didn't get the win. On the last lap the leader was spun by the second place car, giving Marlys the lead. The yellow flag was thrown as the cars came to the checkered flag, however. The race order was determined by how the cars finished the previous lap, which meant Marlys would get 2nd place. Marlys couldn't make much progress from her starting position near the back of the feature, and finished in 6th. She maintains a six point lead in the Pure Stocks. TNT Speedway (8/9/03) - The track was very wet early in the night. The Street Stock heat race was mostly single file racing due to the mud. Tate finished 2nd and Fritz a spot behind him in 3rd. Fritz started the feature in 4th and Tate in 5th. The car in front of Tate bobbled early sending Tate back to 7th. Tate would only work his way to 5th by the end of the feature. Fritz remained near the front throughout the feature and finished 3rd. Riverside Raceway (8/5/03) - It was a rough night for Marlys. She finished her heat in 6th, and was only able to finish 5th in the Pure Stock feature. She maintains the point lead, although the distance to second place closed by 5 points. Fritz had a decent 2nd place finish in the heat race. Passing was difficult in the feature and Fritz wasn't able to advance much. He finished 5th and lost the Street Stock point lead. TNT Speedway (8/2/03) - Rainout. Riverside Raceway (7/29/03) - It looked like Marlys had a good chance at winning her Pure Stock heat. Unfortunately with four laps to go in her heat race the leader got loose off of turn four and practically came to a stop directly in front of Marlys. Marlys got on the brakes hard to avoid hitting the sideways car, which caused her car to stall. The yellow was thrown after Marlys couldn't restart her car, and she was put to the back. In the last four laps Marlys charged through the field to finish 2nd. Fritz started on the outside front row of his Street Stock heat. He got a good jump on the pole-sitter and went on to lead every lap of the race. Marlys worked her way from near the back of the Pure Stock feature into second place. On the last corner of the last lap the leader had a tire go flat and spun. Marlys took the checkered first. What appeared to be a feature win for Marlys was reversed after the race was completed. The leader's flat tire was caused by running over a bumper on the track. The ruling was that the last lap wasn't completed due to the bumper on the track, so the checkered flag lap didn't count and the previous completed lap would be used to score the cars instead. Fritz started deep in the Street Stock feature. He gambled early in the race by pulling a three-wide maneuver between two cars on the front straightaway. The gamble paid off giving him 3rd place. He was not able to advance any further and finished the feature in 3rd. Marlys and Fritz both continue to lead the points in their respective divisions at Riverside. TNT Speedway (7/26/03) - For the second week in a row rain fell during the night but the Street Stocks managed to get in a full night of racing. Tate started 3rd in his Street Stock heat. The leader slid very high out of turn two early in the race giving Tate the opportunity to pass. Tate took the lead and went on to win the race. Fritz took the lead early in his heat race and also went on to win. Tate started on the outside front row of the feature. He could not get a jump on the pole-sitter though. He held on to second place for the first several laps. The handling went away on the car as the track changed and he eventually finished 4th. Fritz started further back in the feature but was able to work his way past Tate to finish 3rd. Fritz remains second in Street Stock points and Tate remains third. Riverside Raceway (7/22/03) - Marlys had a great night of racing. She started off the night by winning her second heat race this year. Fritz finished 2nd in his Street Stock heat race. Marlys' car was on a rail in the feature. Attrition also worked in Marlys' favor in the feature. She worked her way from the back to convincingly win her second Pure Stock feature of the year. She also reclaimed sole possession of the Pure Stock point standings. Fritz was unable to make any progress in his Street Stock feature. He finished 5th. TNT Speedway (7/19/03) - The Street Stock field was the thinnest of the year with only seven cars showing up this week. Tate was driving Marlys' Pure Stock car this week in the Street Stock division. Fritz started the Street Stock heat in 3rd while Tate started 5th. Fritz couldn't make up any ground in the heat and finished 3rd. Tate lost a position to finish 6th. Rain fell after the last heat was run, but stopped about 20 minutes later. After packing the track during intermission the track was in great shape for the features. Fritz and Tate started the features in the same positions as the heat, with Fritz in 3rd and Tate 5th. The feature ran many laps without a yellow. Fritz moved up a position after the 2nd place car spun. Fritz didn't have anything for the leader though, and ended up in 2nd. Tate finished 5th. Riverside Raceway (7/15/03) - Marlys finished 2nd in her Pure Stock heat race. Marlys was running as high as 2nd in the feature but eventually lost a position to finish 3rd. She is now tied for the lead in Pure Stock points. Fritz won his Street Stock heat race. In the feature Fritz worked his way up to a 3rd place finish, and extended his Street Stock points lead by a few points. TNT Speedway (7/12/03) - Fritz and Tate swapped cars for the night at TNT Speedway to do some troubleshooting. Fritz and Tate both drew the same heat. Fritz started 2nd row inside and Tate in last a row behind. Fritz finished 2nd and Tate in 3rd. Fritz started the Street Stock feature on the pole and Tate started 5th. Fritz led for more than half of the feature. Later in the race Tate's left front wheel touched another car, jerking the car to the left and causing the cause to spin. Two other cars were caught up in the spin causing significant cosmetic damage to the left rear quarter of Tate's car. Unfortunately Fritz didn't get a good jump and on the restart lost the lead. He finished in 3rd. Tate was able to get the damaged fixed to his car during the yellow and managed to finish 4th. Riverside Raceway (7/8/03) - Marlys finished her Pure Stock heat in 3rd. The track made passing difficult in the features. Marlys worked her way up to a 4th place feature finish and maintains the Pure Stock points lead. Fritz drove Tate's TNT Speedway car at Riverside Raceway for the first time this year, and it worked well for him. Fritz finished 2nd in his Pure Stock heat. Fritz started the feature on the front row. He fell back to 2nd at the start, but was able to pass the leader early in the race. Later in the race Fritz was spun from behind, but no damage was done and he held on to the lead for the remained of the race for his second feature win of the year at Riverside. TNT Speedway (7/6/03) - Fritz started 3rd and finished 3rd his Street Stock heat. Tate drew the pole of his heat for the second night in a row and led every lap. Fritz would line up in 4th and Tate in 10th for the feature. Cautions took out many of the front runners. Fritz was given a flat left rear tire early in the feature. Tate would avoid the wrecks and finish 2nd. Fritz charged from the back after changing his flat tire to finish 4th. TNT Speedway (7/5/03) - Fritz and Tate were both in the same Street Stock heat with Tate starting on the pole and Fritz on the outside second row. Tate couldn't get a jump on the start and fell to second place early in the race. Fritz would also get the jump on Tate on a restart. Fritz finished 2nd and Tate in 3rd. Fritz was lined up in the outside second row for the feature. His car was unpredictable through the bumps, and he eventually lost a few positions to finish 6th. Tate started deep in the field. He was able to gain a few positions during the feature to work his way up to a 5th place finish. Riverside Raceway (7/1/03) - Marlys started near the back of both of her races because she leads the Pure Stock division points. She finished 3rd in her heat. The track was very slick for the Pure Stock feature due to the long 40 lap Street Stock feature earlier in the night. Marlys worked her way up to a 3rd place finish and maintains her Pure Stock point lead. Fritz won his Street Stock heat race. Tate was declared the winner of his heat race after the race leader failed to scale immediately after the heat was completed. Fritz started on the pole of the 40 lap feature with Tate lined up directly behind him. Fritz couldn't get the jump on the start and fell back to the second position. Tate bumped Fritz in corner one, sending Fritz to the infield and Tate to the back of the pack. Tate refueled his car during the caution because his fuel cell couldn't hold enough fuel to race from start to finish without refueling. Tate would eventually climb his way back to 4th position late in the race, but pitted again after the power steering belt came off. Fritz couldn't make a move on the leader and finished 2nd. Tate finished 6th. TNT Speedway (6/28/03) - Fritz finished 2nd in his Street Stock heat and Tate finished 3rd in his heat. Tate would get his second feature DNF in a row early in the Street Stock feature when he parked the car after the motor lost oil pressure. Fritz had a strong run going in the feature until he was hit from behind in the second corner late in the race, sending him into the infield. He was able to recover, but lost a few positions as a result of the hit. He finished 5th. Riverside Raceway (6/24/03) - Rainout. TNT Speedway (6/21/03) - Fritz and Tate were both in the same Street Stock heat race this week at TNT Speedway. Tate drew the pole while Fritz wasn't so fortunate and had to start in 5th. Tate led every lap of the heat race. Fritz worked his way up to a 3rd place finish. Neither Tate nor Fritz had a good feature draw and would start next to each other in the 4th row. A couple early wrecks would work to Tate's advantage helping him move to 2nd place early in the race. Fritz would eventually work his way up to 3rd place behind Tate. Tate would lose an axle with a few laps to go. Fritz finished in 2nd place. 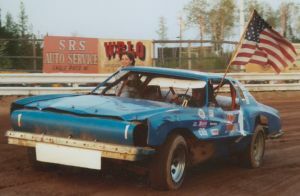 Fritz carries the American flag at TNT Speedway. Riverside Raceway (6/17/03) - Fritz won his first Street Stock heat of the year at Riverside Raceway. Marlys finished fourth in her Pure Stock heat. Fritz wasn't able to make much headway in the Street Stock feature. He finished 4th, and maintained 3rd place in the Street Stock point standings. Marlys survived an early wreck caused by a spinning car which created a chain reaction pileup. Later in the race Marlys would tangle with another car sending it to the guardrail. Marlys was sent to the back but still charged forward for a 3rd place feature finish. She extended her point lead after most of the point contenders suffered problems during the night. TNT Speedway (6/14/03) - Fritz started on the outside front row of his Street Stock heat. He wasn't able to get any traction on the high side of the track and fell back to 4th. In the second half of the race the plastic covering over the dashboard area blew up in front of the windscreen making it almost impossible for Fritz to see out of the car. He still managed to finish the race in 4th place. Tate started on the pole of his heat and led every lap for his first win of the year. Fritz started on the pole of the Street Stock feature, and pulled out to a large lead. The first caution came with a few laps to go. Fritz got a nudge in the left rear wheel after the restart which bent the wheel severely. But the inner tube held air and Fritz would win the feature. Tate started 8th in the Street Stock feature and was shuffled back to 10th early in the race. Tate was able to work his way through traffic to finish in 4th. Riverside Raceway (6/10/03) - Rainout. TNT Speedway (6/7/03) - Rainout. Riverside Raceway (6/3/03) - Fritz finished 3rd in his Street Stock heat. Marlys finished 2nd in her Pure Stock heat, at least that is the way it appeared. The winner of her heat was disqualified after the races were over, giving Marlys the win. Fritz started the Street Stock feature on the 3rd row inside. Before the green flag dropped the car ahead of him lost an axle, allowing Fritz to move up a row. That would not be the end of his good luck in the feature. In the first corner of the first lap the pole sitter spun which brought out the yellow and sent Fritz to the pole position for the restart. Fritz would get the jump on the restart and go on to win the feature. Marlys would start in the 4th row of her Pure Stock feature, but that didn't stop her from racing to the front. Marlys would finish the feature in second place, but the feature winner was also her heat winner and was later disqualified due to an illegal intake. As a result Marlys finished the night with her first feature win of the year and a clean sweep. She also leads the Pure Stock points. TNT Speedway (5/31/03) - Fritz added to his streak of Street Stock heat wins with his third heat win in a row after starting from the pole. Tate finished 3rd in the same heat after starting 5th. Neither Fritz nor Tate had great starting positions for the feature. Fritz drew 3rd row instead and Tate 4th row outside. Tate was able to make some headway early in the race. After an early caution Tate was one position ahead of Fritz, and spent several laps racing near each other. Fritz eventually drove under Tate when he slowed due to traffic. Fritz and Tate would both pass a few cars under green later in the race. Fritz finished 3rd and Tate one spot behind him in 4th. Riverside Raceway (5/25/03) - Marlys started her year off in strong by winning her Pure Stock heat race. Fritz finished 3rd in his Street Stock heat. Feature time was difficult for all drivers due to a very dry track. Dust and dryness made passing nearly impossible. Marlys still managed to pick up several positions in her feature and went on to finish 4th. Fritz struggled with the dust and his car in the Street Stock feature. A flat tire eventually forced him off the track for the night. TNT Speedway (5/24/03) - Fritz started off the night strong by winning his Street Stock heat race on a slippery track. Tate was able to work his way to the lead of his heat, but he wasn't able to hold it and had to settle for 3rd. In the feature Fritz and Tate were both able to drive to 2nd and 3rd place early in the race. Tate eventually fell back a few positions as Fritz continued to battle near the front. Unfortunately the throttle linkage broke in Fritz's car toward the end of the feature, putting him out of the race with a 12th place finish. Tate had worked his way into 3rd place but was booted out of position in corner four and losing several positions in the process. He finished 7th. Fritz and Tate are tied for second place in points. TNT Speedway (5/17/03) - While Fritz continues working on the Skylark his older Monte Carlo will be put into service at TNT Speedway and Riverside Raceway. The old Monte has a new skin and a new sponsor: KM Motorsports. Tate inherited the newer Monte Carlo Fritz raced last year in Street Stock. Fritz and Tate started off the night at TNT Speedway by carrying American flags for the National Anthem. Fritz dominated his heat race by charging from his 3rd place starting position to finishing with a large lead on the rest of the field. Tate struggled with the handling of his car throughout his Street Stock heat. Tate dropped from the pole to 3rd place during the race, but eventually went on to finish 2nd when the leader dropped out due to engine trouble. A new body for Fritz's older Monte Carlo at TNT Speedway. In the Street Stock feature Fritz was originally lined up 6th and Tate 8th, but they both were fortunate to advance a row because the 4th place car was unable to start the race. Track conditions were even worse in the feature than the heats. A thick layer of loose clay made passing on the outside almost impossible, while a few very large holes down low made the racing even more challenging. The race was marred by several cautions. Fritz was caught up in some of the dueling but came away relatively unscathed in each case. Fritz was able to work his way to the front of the pack once, then lost the lead, but eventually was able to regain it and stay there for a clean sweep. Tate was a big beneficiary of the cautions which put several of the front runners to the back. By the last caution Tate was in 2nd place behind Fritz. He was unable to pass Fritz and went on to finish the Street Stock feature in 2nd place. Preseason (3/28/03) - Fritz is building a new Street Stock for the 2003 season, and for the first time in many years it will not be a Monte Carlo. Fritz will race full seasons at Riverside Raceway and TNT Speedway in Street Stock. Marlys plans on racing Pure Stock at Riverside Raceway again in the same car she won the championship with last year. Tate plans on running at least a limited schedule in Street Stock at Riverside Raceway and/or TNT Speedway. Fritz preparing new Street Stock for the 2003 season. Click here for more pictures from the 2003 racing season. Click here for final point standings from the 2003 racing season.